Welcome, friends! We’re about to embark on an incredible journey as we Cultivate Real Love through The Life of Ruth. This book of the bible promises to inspire, encourage and challenge us in new and exciting ways. There’s no one better to introduce our spring season than our Cultivate Founder, Tammy Brown. Read on as she shares her heart and vision for Cultivate 2018…and a special invitation for you! Last fall, I started to pray about what 2018 might look like for Cultivate. As a ministry we will always be rooted in kindness. I’m passionate about encouraging kindness among women, because I know what it looks and feels like when we forget the value of being kind to one another – even when it’s hard, even when we don’t feel like it. But kindness isn’t where we stop. As I prayed and read God’s word, He overwhelmingly placed LOVE on my heart. When I think about what love looks like in the world today, I realize just how far we’ve moved away from God’s definition of the word. If you disagree with me, you’re not loving. If you don’t believe what I believe, you’re not loving. If you don’t see it my way, you are not loving. The world sells us a version of love that says, if you love me, you’re okay with me no matter what. And not just “okay” with me, but you have to be for me, condone my actions, and don’t dare speak out even if you disagree. That’s what the world wants us to believe love looks like. That doesn’t sound like love to me. What does God say about love? That’s the question I want us to answer this season. That’s the love I want us to cultivate everyday. Love rejoices when the truth wins. REAL love is Jesus giving up His life for us. This season, I want us to Cultivate LOVE so that together we learn what it looks like to love one another, without compromising our faith in the One who loves us most. When Cultivate was born, Sandals was a spiritually young church. While we firmly believed in sharing and teaching God’s word, we also knew we needed women who were older and wiser to speak into our lives; into your lives. That’s where book club began. 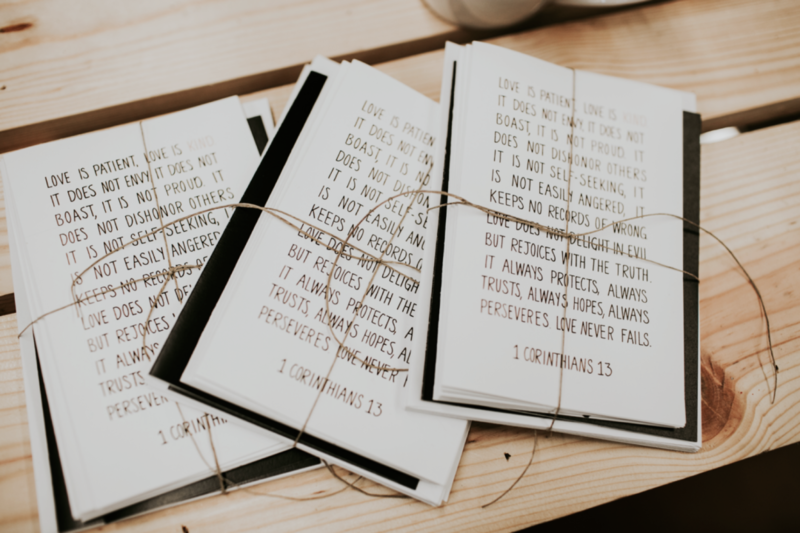 We wanted to read the words of strong, Christian women who had walked before us and could mentor us on the spiritual disciplines we needed to grow in. Together we could learn from their insight into life and the truth of God’s word. The voices of those great authors has been amazing, but there is no voice in our life that should replace that of God. There’s a lot of noise out there, and we need to hear God first. I love that you are in community at Sandals Church. I love that you trust Matt and I to lead you to truth and help you be real with yourselves, God and others. But ultimately, you cannot rely on Sandals Church – any church, any person – to bring you God’s word. You need to seek it out for yourself. As women, we need to take ownership of our spiritual growth. The bible needs to be ours. We need to read it, seek to understand it, and live out what it tells us – because the world needs more of God and His version of love. The world needs more Christian women willing to stand up for His truth. The book of Ruth is the perfect opportunity for us to cultivate God’s word in our lives. Ruth is one of us. She experienced hard things and proved to be resilient, strong, and courageous. Life dealt her tragedy and loss, but she held fast to kindness, loyalty and love. Through Ruth – through God’s word – we’ll see our own story. We see that the bible isn’t just a book of words, it’s a book of truth that is relevant to our life right now. Through this book of the bible we are going to learn to discern God’s voice and truth over all the noise and lies around us. The bible can be intimidating, I get it. That’s why I love Cultivate so much, because no matter where you are in your own faith, you aren’t doing this alone. We’re in this together. Connecting in community is a huge part of growing spiritually. Cultivate is a place you can feel safe; a place you will be welcomed with exceptional kindness, so that you can work through the truths you are learning with women just like you. Our Cultivate Teachers are willing and ready to be REAL and share their lives with each of us. They have studied and prepared to not only share wisdom and insight, but show us how to apply God’s truth to our life. That’s powerful; that’s how we change. Like so many of us, Ruth had no idea how her story would end. She could not have predicted what God would do and how He could turn a bitter ending into a joyful beginning. We don’t know how our story will end, but through this study we’ll learn what it looks like to LOVE the way God wants us to. We learn to treat others the way God calls us to. We’ll learn to exchange the lies we tell ourselves for what is pure, true, and good. We’ll learn that if we’re faithful to cultivate God’s word into our heart and life, He is faithful to author our story with utter perfection. We’ve grown from book studies, but now it’s time to watch and see how God’s word can change our faith, our story, our life. I want to invite you to join us this spring at Cultivate. I want you in God’s word, and I want to see His word change you! I absolutely love this! I haven’t had the opportunity to join Cultivate in the past, but this year God has opened that door for me. Through prayer God has revealed my word of the year to be “love” and I just know that this study will be a continuation of what He wants to reveal to me and have me grow in. Thank you for your faithfulness, I cannot wait to learn from such spiritually strong women! Hi Kendall – We’re so glad you’ll be able to join Cultivate this season! Looking forward to growing in LOVE together. Thank you for the honesty and truth about God and his love! This is the kind of community I’d love to be a part of, but I’m a college kid living many states away from Sandals. Aside from the blog and other social media, is there any way I could connect to this ministry? Hi Emma! Thank you so much for reaching out. You can follow @cultivatewomen on both Instagram and Facebook to stay up to date on our programming at Sandals Church. We offer seasonal studies, and we’re currently studying the life of Ruth. If you visit the registration page on the blog, you can learn more about our off campus study method to study on your own. That would be a great option for you living out of state!